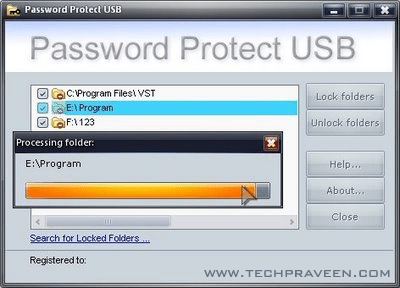 Password Protect USB is a software program designed to protect an unlimited number of folders with your personal passwords. To protect your information, you do not have to move all your files to a special secure folder; you can set a password on any folder containing your sensitive data. The first time you need to run Password Protect from the installation directory. After that, you can simply right-click the folder in Windows Explorer and select Lock With Password Protect USB from the right-click menu. Password Protect USB supports Windows XP, 98, 2000, NT, ME, Vista. It is very user-friendly and easy to use.